Are you having a mare with Ransomware? Ransomware has become a common and dramatic problem and the recent waves of attacks are demonstrating that new variants emerge each day in what seems an endless arms race where the attackers seem to prevail. However, even if the attack vectors are increasingly complex, the attackers cannot conceal themselves as the infrastructures used to launch these campaigns, despite extremely volatile, exploit elements of the internet, such as IP and domains, that cannot be hidden. Monitoring large scale data allows to identify these infrastructures, where attacks are staged, and to enforce a new predictive security model particularly effective against Ransomware. 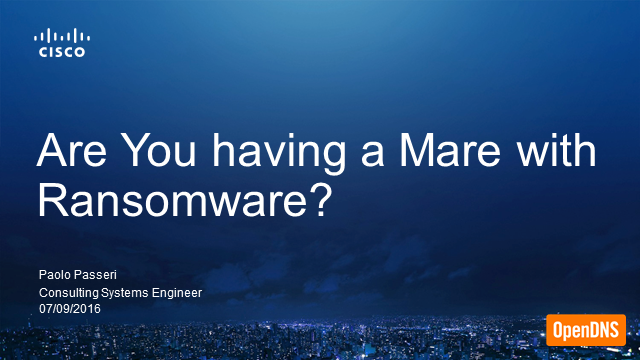 Title: Are you having a mare with Ransomware?